The weather forecast was for rain – and it did! 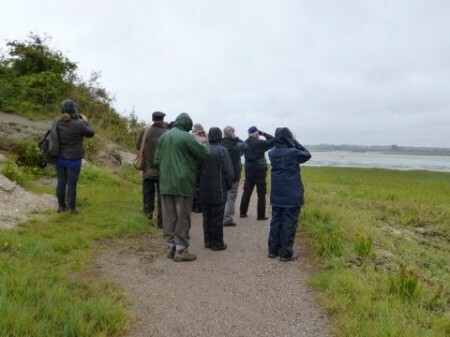 But that did not dampen the spirits of the 13 members of the group that turned up to go birdwatching at Riverside Country Park. However, no one disputed my suggestion that we first went for tea or coffee in the visitor centre and wait for the tide to come in! This we did and we were outside again just in time to watch the birds on the mudflats being pushed ever closer by the rapidly rising tide. It would be wrong to say we had “good” views of the birds as our binoculars were covered in rain droplets but we saw Redshank, Black-tailed Godwit, Turnstone, Ringed Plover and one very smart Grey Plover with its black belly and breast. I think we got just over the 20 species mark in total. The star birds for me were the many swallows flying low over the water following the coast in an easterly direction – no doubt on their way south to find better weather. And who can blame them! Although we got a bit wet we were not miserable and it was good to see birds and the landscapes in “bad” weather. Back at the visitor centre cafe I was allowed to have “ham, egg and chips” for lunch. So a good end to the morning! Thanks to everyone who turned up.